Thanks to Wheelie Catholic for this. The Access Inclusive Fitness Equipment is up for a James Dyson award. Be sure to check out the video – it’s both slickly designed and well promoted. And until it actually comes to market, how do you get hold of the bar on the lat machine? I seriously need to know. 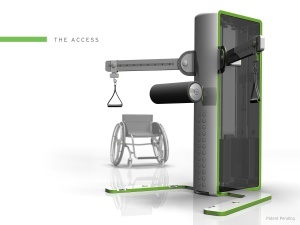 In responce to the article, the idea of inclusive fitness equipment is not a new one, as the worlds leading fitness suppliers in collaboration with an organisation in the UK called the Inclusive Fitness Initaitive have been designing accessible fitness equipment for over 7 years. There are many products that have been modified & developed to help meet the needs of disabled people in the gym environment. With regards to the question above, there are many fitness suppliers that can offer an accessible lat-pulldown machine with a bar lowering mechanism and an upper body multistations like the design above.